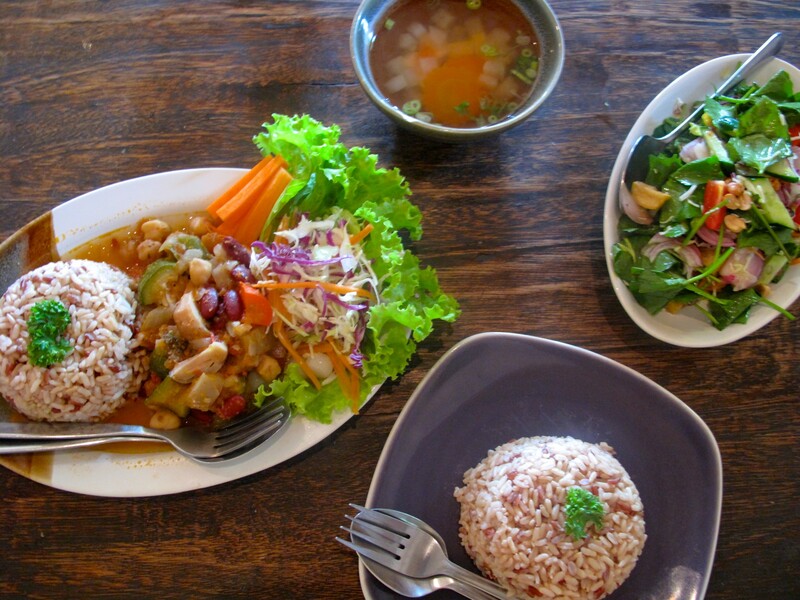 Traditional Chiang Mai cuisine, or Muang Food, is mouthwatering and distinct from regular Thai food. With the setting sun, you will pedal forth for a culinary journey of Chiang Mai. Journey through Chiang Mai's backstreets and alleyways, stop at street-side stalls and food markets to get a taste of authentic Chiang Mai with a local expert. At the first stop on this night food tour, you will have a chance to taste of some of the different kinds of exotic fruits found in Thailand. Miss Nong has been selling high quality 100% fresh fruit juice at the city's navel for almost 10 years. Accompanying the fruit juice will be a tasty Chiang Mai street sweet. The ancient city of Chiang Mai was built to reflect Hindu cosmology with Mt. Mehru as the center of the universe. The Navel of the City Temple or Wat Intakin was the original site of the city pillar, which is the center of the city and therefore named the city's belly button. We will spend a few minutes here listening to the monks chanting, admiring the 700-year-old White Buddha and learning a bit about the history and culture of Chiang Mai. From here, back on the bike and ride past the Three Kings Monument as our next stop on this adventure. Next, roll up to a bustling food market, the highlight of your Chiangmai food adventure. We will stop at a green papaya salad food stall to order some Chiang Mai style 'Som Tum' for our dinner. Then it is off for a tour of the market to learn about northern Thai food. Watch a food seller making chili paste and stop by a stall selling curries, stews and soups. How about some grilled eggs or perhaps something cooked in a banana leaf? Choose a medley of exotic fruits for the end of the meal. Have no fear; all the dishes selected will be authentic Chiang Mai cuisine, but there will be nothing weird or strange (No bugs or snakes). Everyone will find something they can enjoy, vegetarians included. Once we have finished our shopping, we will return to the Som Tum stall where a table is set for us to sit down and unpack our selections from the market. Before enjoying the gastronomic wonders of Chiang Mai cuisine, your local guide will give you a short lesson on how to properly eat sticky rice, the staple of Northern Thai food. The guide will explain each dish and explain some of the Chiang Mai traditions about the food. Then dig in! You'll experience traditional cuisine that's hard to find in luxury restaurants. Along the way to our last stop for the night, we will have a typical Shan or Tai Yai snack, just in case you did not have enough to eat for dinner. You'll find the flavor to be truly amazing. The last stop on our food tour will be for Mae Salong tea and a traditional Thai dessert in a peaceful riverside setting. After filling your tummies with tasty Thai food, slowly wind your way back through the late evening streets of Chiang Mai to the original meeting point. Say goodbye to your guide and conclude your unforgettable Chiang Mai bike food tour! 05:00 PM - 05:30 PM: Pick you up at a designated meeting point. Exact time and location will be confirmed after reservation. Have a taste of some of the different kinds of tropical fruits in Thailand. Miss Nong has been selling high quality 100% fresh fruit juice at the city's navel for almost 10 years. Accompanying the fruit juice will be a tasty Chiang Mai street sweet. Visit the Navel of the City Temple or Wat Intakin, which is the center of the city. Spend a few minutes listening to the monks chanting, admire the 700-year old While Buddha and learning about the history and culture of Chiang Mai. Pass through the Three Kings monument and learn a bit more about Buddhism and merit making. Visit the local food market. Stop at a green papaya salad food stall to order some Chiang Mai style 'Som Tum' for our dinner. Tour around the market to learn about northern Thai cuisine. Get a short lesson on how to properly enjoy local Thai food. Along the way to the last stop for the night, you will have a typical Shan or Tai Yai snack. Have Mae Salong tea and a traditional Thai dessert in a peaceful riverside setting. Bike back to the meeting point after a night full of yummy dreams of tasty Chiang Mai cuisine. Say goodbye to your local guide. As we cycle at night and in market areas, this tour is not suitable for children under 12 years old riding alone, however, children in baby seats or riding a tag-along are welcome to join.